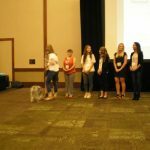 CANINE THERAPY corps presented at the “Welcome to ATRA’s 2016 annual conference,” during the opening general session. They are a program of dedicated volunteers in the Chicago area who use certified therapy dogs to help people with rehabilitation therapy. It was so awesome seeing all of those dogs. However, my camera battery started to go out during this time and I didn’t get many good pictures like I wanted to. Callie Cozzolino talked about the dogs and what they can do to help people. Strength activities, fine motor skills, range of motion activities, and activities of daily living. 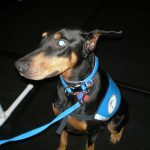 Dogs can be used for rehab needs, including: sitting, balance, flexibility, and turning. There were activities where the individual (in need) role-played by students from Grand Valley State University (Michigan). One activity consisted of raising legs so they dog jumps over them or goes under. It is a fun way to play with dog, while building strength in legs. Of course, there was a lot of laughter too with the dogs. She also discussed the cognitive component and social component as well. 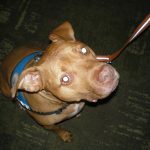 I [Danny Pettry] recall reading that people with animal therapy dogs are approached socially more often than those who don’t have one. – so there is a big increase in social connectedness.